Enjoy the benefits of working at a screen that floats. The Innovative 7Flex LCD Monitor Arm is the easy addition to your desk that'll have you working more comfortably in no time. With an extension of 24 inches, 16 inches of height adjustments, and 360° rotation on three joints, you'll be able to pose your screen where you want it. The arm is fingertip adjustable, so repositioning the monitor arm is quick and easy. 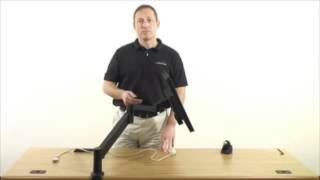 The included FLEXmount offers six mounting options depending on your unique desk setup. Secure your screens and experience the benefits of better ergonomics with the use of one handy accessory. Brilliant product. I am using this flexi arm in my boat for holding my tv.